Some 32 percent of respondents to a March survey reported making a purchase after seeing a product on Pinterest or a similar picture and video sharing social media website. Bizrate Insights, which sells customer feedback and ratings solutions to online retailers, surveyed 3,741 online buyers from March 22 to 26, 2012. According to Bizrate, the answer is a clear yes. 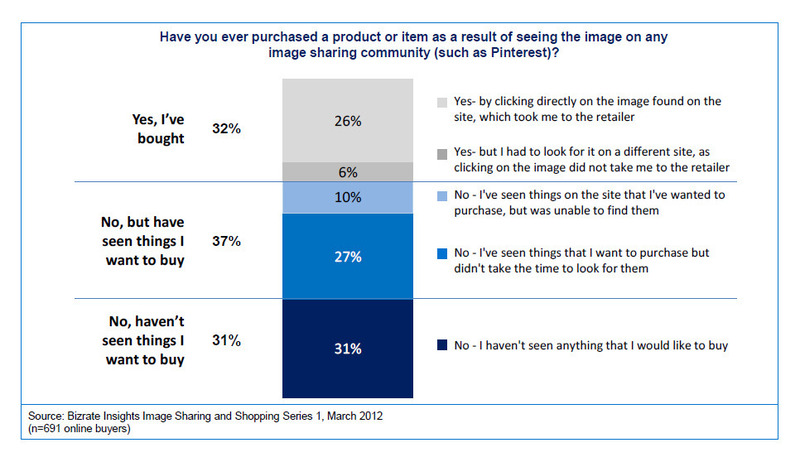 Overall about 37 percent of online shoppers were familiar with social image sharing sites and 32 percent of those who were familiar — 691 online shoppers — with the sites had made a purchase as a result of seeing an image there. Bizrate Insights found that nearly 1 in 3 online shoppers purchased as the result of seeing a product on Pinterest or a similar social image sharing site. Although one might wish that Bizrate had used a larger sample, the findings are still significant in light of how popular Pinterest appears to be. In March 2012, Pinterest had some 2.3 billion page views, according to an informational graphic from digital marketing firm, Tamba, making it the third most popular social media site behind Facebook and Twitter. The Tamba infographic summarizes Pinterest data from several sources. Pinterest also enjoyed more than 4 million unique visitors per day in March, up from 2 million per day in January 2012, and an average Pinterest user spends more than 14 minutes on the site per visit. Those users see hundreds of pinned images and graphics, many of which are linked back to retail sites. Jeffery Zwelling, CEO of Convertro wrote in VentureBeat that Pinterest now represents some 17.4 percent of social-media-driven ecommerce sales, up from just 1.2 percent in the second quarter of last year. 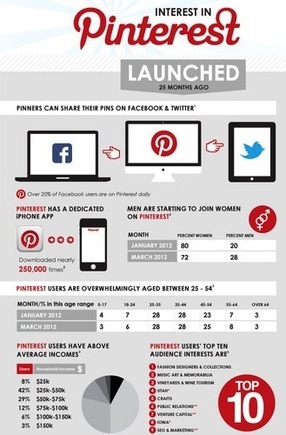 The key to ecommerce success on Pinterest may be in how much users share. A recent study from RJ Metrics, a business intelligence firm, estimated that roughly 80 percent of the content on Pinterest had been repinned — that is, shared with followers. This propensity to pass images along to friend after friend, means that some product images are getting significant exposure. What’s more, pinned images that include prices seem to be no less likely to be shared. So What’s an Ecommerce Marketer To Do? The lessons from all of this data may include (1) that merchants should be on Pinterest and similar sites pinning products and repinning posts from others; (2) online stores should make pinning product images as easy as possible; and (3) affiliate programs should facilitate pinning for profit. All of the social image sharing sites mentioned offer free accounts to individuals and businesses. For online merchants, it may make sense to focus on Pinterest and one or two others, pinning and sharing regularly on these sites. Retailers like this one can benefit from posting and sharing on sites like Pinterest. It is also important to have attractive, large product images that will encourage shoppers to pin them. It is also a good idea to include a “Pin It” button on each product detail page. Finally, offer affiliates high quality, life-style images featuring products to post on Pinterest.